Swashbuckling Delhi wicket-keeper batsman Rishabh Pant has started his cricket career in the longest format of the game on a promising note. In his debut Test against England, Pant started his innings by smashing a six off Rashid Ali’s ball and after a few misses, scored a brilliant century against the same opponents at The Oval in the final Test match of the series. Pant went on to score his maiden Test half-century against the West Indies in the opening Test match of the two-match series in Rajkot. Though Pant, who scored 92 in the first Test was unlucky to miss out on a well-deserved Test century, has now moved past the record of former Indian skipper MS Dhoni. 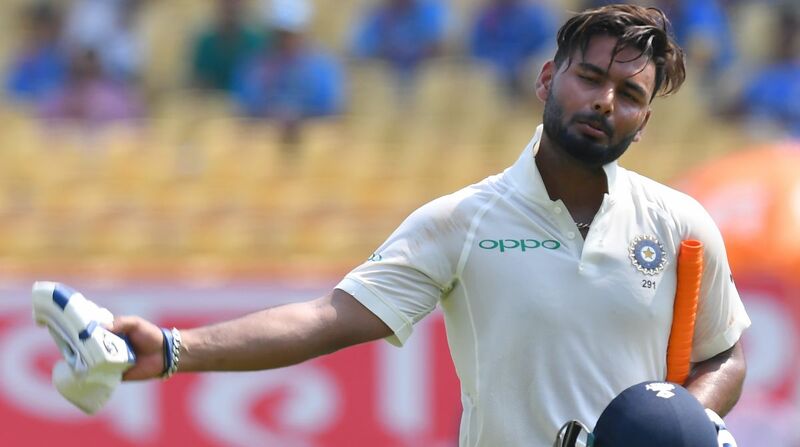 Pant now holds the first spot as far as runs scored by an Indian wicket-keeper after the first 5 Test matches are concerned. On the third day of the second Test at Hyderabad, Pant was dismissed by Shannon Gabriel for 92 and so far, he has amassed 346 runs which is well ahead of MS Dhoni who had scored 297 runs after his 5 Test matches. The 37-year-old wicket-keeper batsman’s highest score during that period was 148 against Pakistan. Dhoni had scored one half-century. On the other hand, Pant’s highest score is 114 against England and he has two half-centuries against his name.